Venezuelan President Nicolas Maduro told Euronews the US has tried to impose a "puppet government" in Venezuela, but that the "coup d'état... has already failed". Maduro told Euronews' Anelise Borges that Washington had used "all its political, diplomatic and economic power to try to impose a puppet government in Venezuela. A thing never seen before in our history”. The US last month slapped sanctions on Venezuela's state oil firm, which is a key source of foreign income in the country, to pressure Maduro into stepping down. 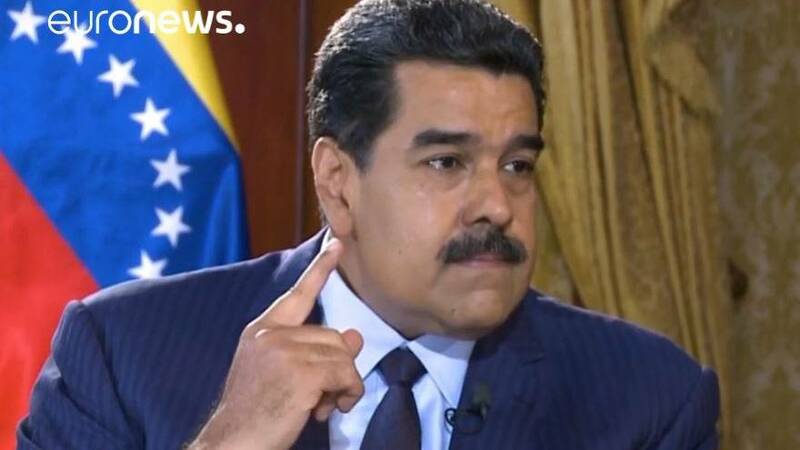 "Since Venezuela has the world's main certified oil reserve, we are certifying the world's main gold reserve, the fourth gas reserve, strategic mineral reserves such as coltan... Venezuela has always been in the geopolitical interest,” Maduro said. Juan Guaido declared himself interim president three weeks ago, calling Maduro's re-election last year a sham. Many European countries and the US have recognised Guaido as the legitimate president but Maduro is backed by Russia, China, and Venezuela's military. Thousands of people demonstrated on Tuesday in national protests demanding that Maduro allow humanitarian aid into the country. The protests came after the US and Colombia sent an aid convoy to the Colombian border town of Cucuta last week, where it is being held in warehouses. But Venezuela's military barricaded a key bridge between Venezuela and Colombia in an apparent attempt to prevent aid from entering the country. Maduro told Euronews the aid was "contaminated", citing information he claimed came from Colombia.